For the rice: 1 cup of rice and 1/4 head of caulifower, cooked with 3 green onions in the rice cooker with a dash of salt. Saute 1 lb mushrooms in a dutch oven, DO NOT add oil. Cook until the mushrooms release some of their juices (about 1 TBL) and then remove mushrooms (leave liquid in the pan) and place them in a bowl. Cover mushrooms with balsamic vinegar and hot sauce (we use Cholula) and set aside. Mix together 1 cup water, 3 garlic cloves minced, 1 tsp black pepper, 1 TBL soy sauce, 1 tsp parsley, and 1/2 onion powder. Pour mixture in the dutch over and bring a boil. Drain most of the liquid from 2 cans of beans (we used white and pinto) and add to the dutch oven. Add 1 bunch of kale (dinosaur) and reduce heat to low, sprinkle with more black pepper. Cover pot and cook 10-15 minutes. Add mushrooms and cook 5-10 minutes uncovered. Serve over rice-cauliflower and top with more hot sauce. 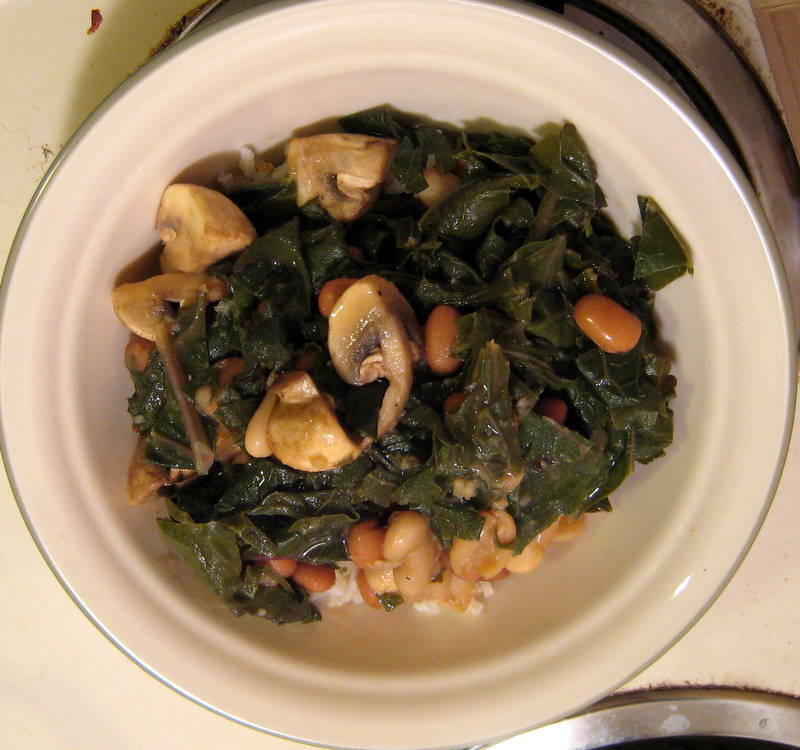 This entry was posted in beans, cauliflower, kale, mushrooms, rice, vegan and tagged beans, caulflower, cholula, kale, rice, vegan by Beans, Figs and Katz. Bookmark the permalink.